Today is a day of poignant memories for us and for the entire nation. We meet here to pay homage to the memory of our late Prime Minister, Shri Lal Bahadur Shastri, who a year ago laid down his life in the service of the country. Shastriji was a man of quiet greatness, who lived for India and for peace, and who died for India and for peace. He was identified with the Indian people. He was imbued with the spirit of service, and he thought always of the welfare of the people. He led our country at a time of severe trial, and helped India demonstrate both unity and determination. Shastriji was a great product of the Gandhian era. The basic teaching of Gandhiji was that all men are brothers and differences among them should be settled non-violently. Non-violence to Gandhiji did not mean the mere absence of violence. It was not a negative concept; it was a positive quality of always seeking friendship and reconciliation, of believing that people can evolve towards a higher level of living only in, and through, peace. This was how we fought the British, eschewing violence and believing completely in reconciliation and negotiation. This was also Shastriji’s belief and, as I said, he not only lived for it, but he also gave his life for it. We have tried in nineteen-and-a-half years of freedom to reflect this profound belief in our internal and international policies. In our foreign policy, we have always pleaded for the settlement of disputes without resort to arms. Our opposition to military blocs, the doctrine of PanchSheel, our initiative in Korea and Indo-China and numerous other assignments on behalf of world peace—all these have sprang from our belief in the peaceful settlement of disputes. The Tashkent Declaration is a reaffirmation of this policy. What Shastriji talked there and signed there was nothing new for India. But the most worthy fact about Tashkent was that through fruitful exchanges between our leader, Chairman Kosygin and President Ayub, Pakistan also subscribed to the importance of eschewing the use of arms to settle differences. On this first anniversary of the Tashkent Declaration, I repeat anew our dedication to the principles enunciated in Tashkent.They are the principles bequeathed to us by Gandhiji and by Shastriji. And they are linked with Shastriji’s life and work. We shall gain nothing by trying to analyse whether the Declaration has achieved as much as it was hoped it would, and if it has not, who is at fault. What is more to the purpose is to tell ourselves and show to the world that India stands by it. 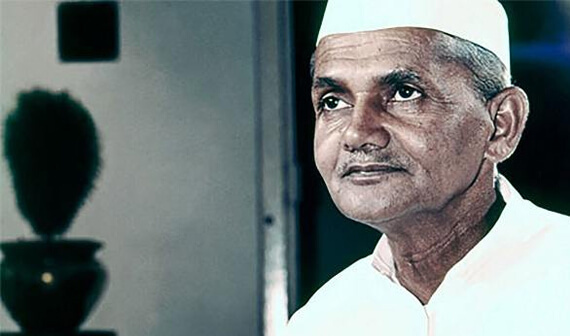 Shastriji left us the slogan Jai Jawan, Jai Kisan. This new slogan is in a way of speaking, an extension of our old slogan Jai Hind. India can have victory only through jawans [soldiers| and kisans[farmers]. The freedom of our country is guarded by the jawans as well as by all those who work and produce. In the trying days of Kutch and later in the northern conflict, Shastriji wanted the nation to clearly realise that the defence of the country required the strengthening not only of the defence forces, but also of the economic base. At present there is no fighting, but the military threat has not receded. The jawan has to be alert. But we have had another invader, namely drought, and this invader cannot be fought by the Jawan but by the Kisan. Unless we achieve food self-sufficiency our security and exist­ence will be in peril. This we should do in the minimum time, four or five years. The only way we can see that no one pushes us around is by becoming self-reliant. I think this is what Shastriji had in mind when he gave us this meaningful slogan. Many voices will join us today in paying tribute to his memory. We miss him because we were close to him and we were accustomed to his advice and guidance. The nation misses his solicitude for its problems and his gentle presence.